For decades, the Blue Angels, Thunderbirds, and Golden Knights have taken to the skies to entertain and delight audiences around the world. These three groups are unique, and each has its own rich history. What they all have in common, though, is their ability to thrill people of all ages by demonstrating their immense skills and talents. The Blue Angels are a part of the United States Navy. They were formed in June 1946 under the orders of Admiral Chester W. Nimitz as a way to keep the public interested in naval aviation after World War II ended. The Blue Angels got their name when, during a planning session for an upcoming show in New York, one of the original team members read about the Blue Angel Nightclub in The New Yorker and suggested that as the team’s name. The Blue Angels’ colors are blue and gold, the official colors of the U.S. Navy. Based out of Pensacola, Florida, the Blue Angels entertain thousands of onlookers each year with their aerobatic performances in the McDonnell Douglas F/A-18-C and F/A-18-D Hornets. And for transport, they fly the C-130 T Hercules, known to many fans as Fat Albert. During the shows, the solo pilots reach speeds of up to 700 miles per hour and come within 18 inches of each other during certain maneuvers (in particular on called Diamond 360). The public is always welcome at Blue Angels shows, as well as at practice sessions, which are held at 8:00 a.m. most Tuesdays and Wednesdays at the National Museum of Naval Aviation at NAS Pensacola, Florida. After Wednesday practices, the team members visit the museum to answer questions and sign autographs. If you'd like to stay up-to-date with the Blue Angels, following them on Facebook or Twitter. The United States Air Force Thunderbirds were formed on May 25, 1953, and were originally based out of Luke Air Force Base in Arizona. Part of the reason they chose the name "Thunderbirds" was because of the Native American culture and history that is so prominent in the southwest. In 1956, the Thunderbirds began flying the F-100C Super Saber aircraft and relocated to Nellis Air Force Base, Nevada and have been there ever since. In 1983, they began flying the General Dynamics F-16A Fighting Falcon. Today, during each hour-long show, the fighter pilots take to the skies in their red, white, and blue F-16C Fighting Falcons. While airborne, they entertain audiences of all ages around the world with breath-taking maneuvers. To date, the Thunderbirds have performed worldwide and are generally on the road more than 100 days every year. If you’d like to keep up with the Thunderbirds, follow them on Facebook or Twitter. You can also watch videos of the Thunderbirds and interviews with various team members on their YouTube page. The Golden Knights were formed in 1959 with the goal of competing in international skydiving competitions. 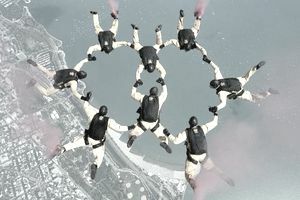 Back then, they were known as the Strategic Army Command Parachute Team (STRAC). In 1961 the DoD changed STRAC's name to the United States Army Parachute Team. As the team competed and won numerous gold medals, people began calling them the Golden Knights. The "Golden" stands for all the gold medals they've won and the "Knights" comes from being world champions in the sport, and is reflective of the group's ability to "own the skies." Fast forward several decades and the Golden Knights continue to delight audiences with their skydiving skills, performing at numerous shows from March through November, most of which fall on Saturdays and Sundays. To maximize the number of shows they're able to conduct, there are actually two teams: the Black Team and the Gold Team. If you'd like to keep up with the Golden Knights, follow them on Facebook and Twitter.